The Almería Province of SE Spain, a semi-arid, tectonically active region, is the focus of a wide range of scientific teaching and research in the earth sciences by universities and associated bodies from around the world. This field guide provides an up-to-date and integrated approach to the geology and geomorphology of Almería Province, compiled by active scientific researchers in the region. The guide assumes a basic knowledge of geology and geomorphology and will be of interest to earth scientists at all levels from the keen amateur through to undergraduate/postgraduate students and academics visiting the region. The guide provides general background on the area, followed by a selection of specialized trips that progressively explore the structure and development of the basins, the shallow marine sedimentation, the continental sedimentation and finally the uplift, dissection and geomorphic evolution of the sedimentary basins. This is the first widely published field guide on the Almería Province and it is unique in both its coverage and integrated earth science approach, providing valuable support for both teaching and research in the region. 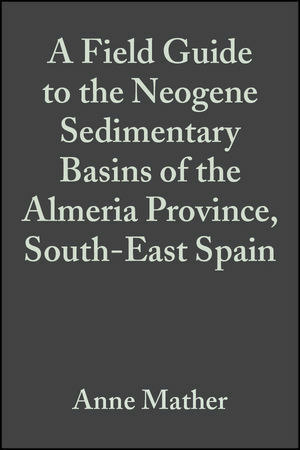 Anne E. Mather and Jose M. Martin are the authors of A Field Guide to the Neogene Sedimentary Basins of the Almeria Province, SE Spain, published by Wiley. 1. Introduction To The Field Guide. 2. Introduction To The Neogene Geology Of The Sorbas Basin. Excursion: Transect Of The Sorbas Basin (One Day). Excursion: A Hike To Cantona Viewpoint (Half Day). 3. The Development Of The Neogene Basins. The Basement Geology Of The Almería Province. Excursion: The Nevado-Filábride Basement Of The Sierra De Los Filábres (One Day). Volcanics Of The Almería Province. Excursions: The Calc-Alkaline Volcanics Of The Cabo De Gata (Half Day). Excursion: The Volcanics Of The Almería And Vera Basins (Half Day). Tectonics And Sedimentation: The Evolving Turbidite Systems Of The Tabernas Basin. Excursion: The Turbidites Of Tabernas (One Day). Excursion: The Carboneras And Palomares Fault Zones (One Day). Excursion: The Sierra Cabrera Northern Boundary Fault And Adjacent Areas (Half Day). Excursion: Temperate Water Carbonates Of The Agua Amarga Basin (One Day). Excursion: Tropical Carbonates Of Níjar (One Day). Excursion: Tropical Carbonates Of Sorbas (One Day). Excursion: Evaporites And Stromatolites Of The Sorbas Basin (One Day). 5. Marine To Continental Transition. Excursion: Late Pliocene Gilbert-Type Fan Deltas Of The Vera Basin (One Day). Excursion: Mio/Pliocene Marine To Continental Transition Of The Sorbas Basin (One Day). Excursion: Plio/Pleistocene Alluvial Environments Of The Sorbas And Vera Basins (One Day). 6. Uplift, Dissection And Landform Evolution: The Quaternary. Excursion: Drainage Evolution And River Terraces Of The Sorbas Basin (One Day). Excursion: Geomorphology Of The Quaternary Alluvial Fans And Related Features Of The Tabernas Basin (One Day),. Excursion: The Landforms Of The Coastal Zone (One Day).